The activist and performance artist talks about his provocative mission and deeply passionate protests. "Occupation of Trump's Silver Globe" at Columbus Circle. Photo by Erik McGregor. 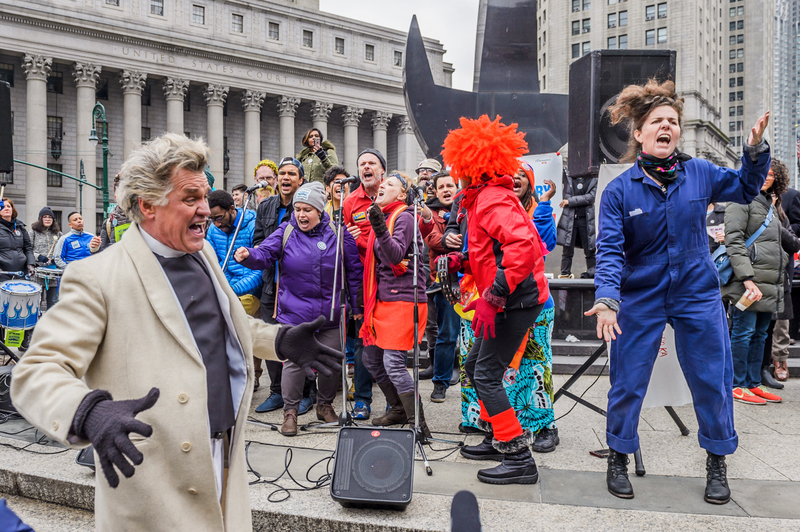 Outspoken, agitprop musical theater collective Reverend Billy and the Stop Shopping Choir is a familiar fixture among New York social activists for its ostentatious public actions against crass consumerism, hyper-capitalism, and anti-immigration laws. It has staged peaceful but provocative protests all over the city against Monsanto, BP, Chase Bank, Starbucks, Disney, and—most recently—the Immigration and Customs Enforcement agency (ICE). The group was the subject of the 2007 film What Would Jesus Buy? (new sandals? a nose-hair trimmer?). Talen recently spoke with us about losing members of the choir to ICE, how the Reverend Billy character first developed, and what gives him hope for the future. What Should We Do?! : Am I talking to Reverend Billy or William Talen right now? William Talen: It’s complex. I think those two characters struggle to dominate each other. Sometimes they get along. I’m afraid you’ll just have to take the risk and see who you get. WSWD: Does Reverend Billy have an origin story? Talen: I started my career preaching in Times Square in front of the old Disney Store, just another character out there with Elmo on my left and the Naked Cowboy on my right. I had created an improvisational, activist theatrical theology, with the help of some wild friends, that cast Mickey Mouse as the Antichrist, and I was there to witness against him. It’s less of a crazy idea than you might think; look at the sweatshops, the union busting, the Disney monoculture. Our 8-year-old hasn’t been arrested yet, but she’s onstage with us singing about change. WSWD: How did that go over? Talen: After six months of doing it religiously, as it were, people started to play along. I’d hear them shouting, “Preach it, Reverend, preach it!” The character developed from there. I found a lot of generosity within him that I didn’t quite expect. I suppose I initially thought of him as a monologue artist, but there was a lot of dialogue happening there on the sidewalks. I started having conversations about consumerism. How do you make your own way through a culture in which all words, all gestures, even our air and water, is monetized? I met early members of the Church of Stop Shopping right there in the madness of Times Square. After the sidewalk years, Savitri D came into my life. I fell in love with a director who could help me make a show, teach our choir its moves, then lead us into the streets. Activists who sing, that’s the basic idea. Our 8-year-old, Lena, hasn’t been arrested yet, but she’s onstage with us singing about change. WSWD: When you go out into public spaces as Reverend Billy, you’re often taking risks with your life and liberty. How do you measure what are you willing to put on the line? Talen: Last fall we did holiday shows at Joe’s Pub, and one of our singers, an undocumented New Yorker, was given the opportunity to take the stage and preach. On January 11, that man was taken by ICE from the Javits Center, in handcuffs, to the Varick Street jail, along with six other members of the Church of Stop Shopping. Our work for so long has been about warning people about things that are hard to see, like child labor in the coffee groves of Starbucks and the dirty, earth-polluting coal that fuels the electricity that we waste. Now, after years of trying to make the invisible visible, here we are just trying to get people to see what’s right in front of them. If you look up from your iPhone, right next door, there are Trump’s thugs pulling fathers out of their own living rooms, dragging them into government vehicles with children clinging to their legs. It’s not abstract at all; you only need to look up. So we’re singing; we’re preaching; but we’re also lying down in front of ICE vans. Talen: Yes. Currently, we’re meeting on the third Thursday of every month at the corner of West Houston and Varick. We bike around the Varick Street jail for an hour and we keep those ICE vans inside. Those notorious white vans are hunting New Yorkers in our neighborhoods, ripping people from their homes, but if they can’t get out then they can’t do Donald Trump’s bidding. The sidewalks and the streets outside that jail are public spaces. It’s the people’s, and the people are saying no. We dream of doing it for 24 hours a day, but right now it’s symbolic. WSWD: You’ve reworked the idea of a revival choir, something a lot of people would see as a conservative religious vehicle, into something very progressive. Talen: Well, our ideology is not Christian, though we welcome Christians to our fight. We pray to and respect the earth itself, and we resist militarism and capitalism as the devil. WSWD: That seems like a mighty big task for a theater group. Talen: When you think about the scale of these systems and the powers we’re up against, it really feels hopeless, doesn’t it? WSWD: So what are your tactics? Talen: They say “act local.” Everyone in the Church of Stop Shopping is a New York actor or musician or performer of some sort. We have Amber Gray, a Broadway star, singing with us. Our collective default environment is a stage. We may not know how to fix the world, but we do know how to act within the framework of the theater. So for public actions, like on January 11, when we were lying down in front of an ambulance that was being used as a prison vehicle, and the police kept pulling us to our feet and pushing us around, that street became a stage. We take a stand at a Starbucks and it’s a stage. The lobby of a JP Morgan Chase is a stage. Union Square is a big stage. These are spaces that are almost always owned outright by a corporation or, if we’re going into a street or a park, covered by laws that demand we have permits that we’ll never get. So we go to jail a lot. But the beauty of theater is that it engenders a kind of hope that comes out when we sing. When you sing, you have hope. WSWD: What’s the first step you’d like to see taken to make New York a better place? Talen: I know we have to eject ICE. It is a foreign body and not at all what New York is about. Lady Liberty is right: Welcoming people is basic to our culture and gives us the knowledge we need to find peace with the earth. We will let things in. We will live with what is new. So there’s some optimism for you. Instead of preaching to the choir, preach with the choir. Join Reverend Billy and the gang at their next protest. Download the app for more inspiring stories from our People Who Make New York Special series.